Comprehensive review of Nip and Fab 365 Body Glow Fix. See what real experts and actual users have to say about this self tanning product. I ended up giving Nip and Fab 365 Body Glow Fix 2.75/5 stars. So it was pretty average. I like the ease of application. The product feels and looks a lot like aloe vera and is very easy to apply. The smell was just ok, and the color produced was good, but I had a few dark areas. I didn’t like how long this one took to dry…it took forever! You can’t beat the price on this one, it’s super cheap at $1.63 per ounce. Overall, this wasn’t my favorite self tanner, but I didn’t despise it. Nip and Fab 365 Body Glow Fix is a clear gel. The gel has the consistency of aloe vera, and kind of looks like it too. The gel isn’t too thick, and I like the way it feels on the skin. Application is very simple and mess-free. The product is a clear gel, so it’s very easy to blend into your skin and it glides on nicely. I didn’t wear gloves while applying this one and it didn’t stain my palms. But I made sure to thoroughly wash my hands after applying it. You don’t have to worry about a dark guide staining anything, which I liked. This one took a long time to dry. It took about 45 minutes before it was completely dry, and while I waited I felt so sticky. I hated the sticky feeling, that’s one of my pet peeves. Whenever my legs or arms would touch each other, I could feel the product on my skin. I wish Nip and Fab 365 Body Glow Fix would’ve dried faster. This one has an odd scent, but it’s not bad. It smells very herbal, kind of like lavender and kind of like aloe vera. I didn’t mind the smell, but it’s a little too strong. Those of you who don’t like the smell of lavender or herbal smells definitely won’t like it. I could smell a tiny hint of DHA as well, but nothing too bad. The smell was gone the next morning, but in its place I could smell a little DHA. The DHA smell was a little stronger than the night before. It went away once I showered the product off. The bottle says this is a “medium” shade, and that’s exactly what I got. After I showered the product off I had a light, medium shade tan. The color is smooth and I like the shade of bronze it produces. I would probably want to apply this one 1 or 2 more days in a row to darken my tan. There were a few areas that looked darker than others, and they looked kinda weird. I wish the tan would’ve turned out more even because the color was actually pretty nice. This one lasted about 3 days, but the darker areas stayed for about 6 days! I wish the dark areas would’ve faded faster, but they just seemed to stick. Eh, if men are in a pinch and need to use this one I think it’s fine. But there are definitely better self tanners out there. This one is easy to apply and produces a decent color, you’ll just have to be extra careful when applying it to areas that are dry (or else you’ll turn out a bit splotchy like I did). 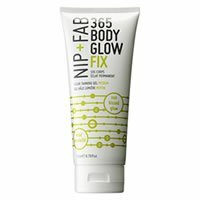 Nip and Fab 365 Body Glow Fix is very cheap at $1.63 per ounce. The entire bottle sells for $11.14 so that’s very affordable. To buy Nip and Fab 365 Body Glow Fix, Click Here. Look and Feel This is clear gel that feels like aloe vera. Application Application is very easy, and it wasn’t very messy. Drying Time It took over 45 minutes to dry! Smell (Before) Smells like lavender with a bit of DHA. Smell (After) I could smell a little DHA the next day. Color Produced I got a medium shade tan, with a few splotchy areas. How Long It Lasts This self tanner lasted around 3 days. OK For Men? Only if they’re in a pinch. Price The bottle is less than $12.00; it works out to $1.63 per ounce.